Another Corrupt MEXICAN Leader Telling Americans, TOO BAD We Are Killing Your Children! Mexican president Andrés Manuel López Obrador declared the end of his country’s “war” on drugs Wednesday — saying his administration would no longer prioritize the prosecution of kingpins. His statement came as US prosecutors urged jurors in Brooklyn to convict infamous Mexican drug lord Joaquin “El Chapo” Guzman. 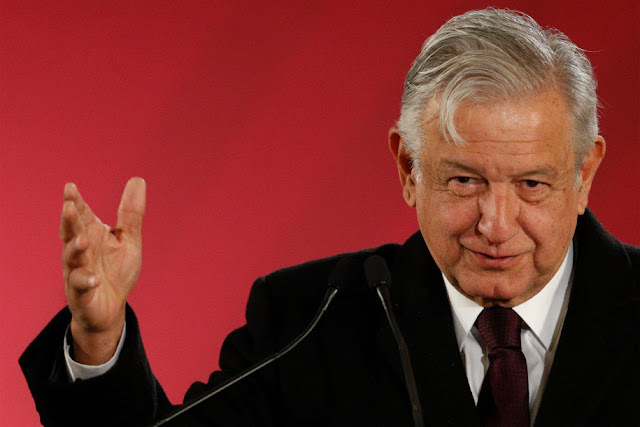 “There is no war, officially there is no more war,” López Obrador said in response to a question from a reporter regarding the lack of kingpin arrests since he took office, according to AFP. Guzman, 61, was extradited to the US in January 2017 — when López Obrador’s predecessor, President Enrique Peña Nieto, was in office — where he is on trial for his role as a leader of the notorious Sinaloa Cartel. When Mexican authorities recaptured the notorious cocaine smuggler a year earlier, Peña Nieto lavished praise on the law enforcement officers who made the collar, saying they were “a source of pride” for the nation. But López Obrador said law enforcement will now instead focus on reducing homicide rates. Guzman’s defense during his trial in Brooklyn has largely focused on the claim that he is merely a “scapegoat,” while his partner in crime, Ismael “El Mayo” Zambada, remains at large and is believed to be hiding out in Mexico. Witnesses and lawyers have also made allegations of government bribery and corruption, with prosecutors claiming in court documents that the Sinloa Cartel paid off a former campaign associate of López Obrador during his first failed run for the presidency in 2006. Government witnesses have also testified that the cartel paid Peña Nieto $100 million in 2012 — although the ex-president denies those allegations.